Double Vertical Splitter with Conveyor | Powersplit International Inc. The Double Vertical Splitter with Conveyor is our flagship model tailored to the professional firewood outfits. This machine can produce over 4 full cords an hour (12 face cords). Our average customer who orders this model usually produces in excess of 250 cords (750 face cords) a year. This unit allows the flexibility to have anywhere from 1 to 4 workers using it at once. The most productive setup on the Double Vertical Splitter has two workers operating the splitting rams and one or two other workers feeding a continuous stream of unsplit wood to the machine. Furthermore, the design of this splitter like most of our splitter line is designed with the worker in mind. An ergonomic design minimizes bending over by the worker and our pedal-activated splitters offers ease of use to split the wood. When Powersplit Designed its splitter line, its main focus was the worker and how we could achieve our objective of taking as much of the manual labor out of the process as we could. A tired worker is a non-productive worker but with Powersplit Splitters we substantially cut down on physical effort and bending down by the worker resulting in significantly more productivity over the course of the day. This translates into more wood split and more money on your bottom line. 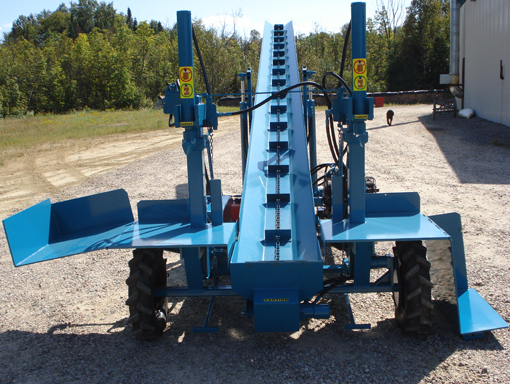 There isn’t another splitter out on the market than can even come close to this unit: Self propelled, integrated conveyor belt, dual work stations, pedal activated splitting rams. BOTTOM LINE THIS IS THE BEST SPLITTER OUT THERE, PERIOD!! !